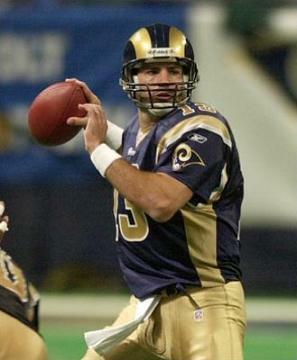 An undrafted free agent out of Northern Iowa who failed to catch on with the Green Bay Packers in 1994, Warner played for the Iowa Barnstormers of the Arena Football League and earned another shot at the NFL with the Rams, who allocated him to the Amsterdam Admirals of NFL Europe for the spring 1998 season. He made the Rams as the third string QB in ’98 and was expected to back up new arrival Trent Green in 1999, but a season-ending injury to Green during the preseason thrust Warner into the starting lineup. The result was a remarkable year in which the obscure quarterback led the league in completion percentage (65.1), yards per attempt (8.7), TD passes (41), and passing (109.2) and the Rams won the Super Bowl. Injuries shortened his season in 2000, but Warner still led the NFL in completion percentage (67.7) and yards per attempt (9.9). Rams went 14-2 to win NFC West and gain top playoff seed in conference while leading the NFL in total yards (6690), passing yards (4663), points scored (503) and touchdowns (62). Won NFC Divisional playoff over Green Bay Packers (45-17) and NFC Championship over Philadelphia Eagles (29-24). Lost Super Bowl to New England Patriots (20-17). Following three outstanding seasons, a hand injury in 2002 greatly hampered Warner’s effectiveness and he lost his starting job in 2003. After a year with the New York Giants, in which he paved the way for rookie QB Eli Manning, Warner moved on to the Arizona Cardinals and revived his career. He led the Cardinals to an NFC Championship following the 2008 season and retired after another productive, division-winning year in 2009. Warner left the NFL as the fifth-rated passer all-time (93.7 rating) and having thrown for 32,344 yards with 208 TDs and a 65.5 completion percentage. While his career was marked by abrupt ups and downs, his regular-season won-lost record as a starting quarterback was 67-49 (9-4 in the postseason).